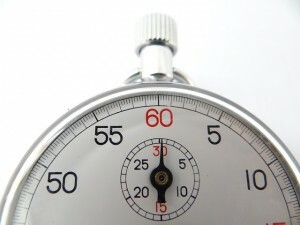 Trading Guide: How Fast Should Binary Options be Traded? Apart from analyzing the market and using specific indications to make trading decisions, the frequency of order placement is probably one of the most important factors that affect the account balance when binary options are involved. It is often the case when traders make several winning turbo trades and decide; “This is easy and fast. This is what I am going to trade,” alternatively, they make several losing turbo trades and decide, “This is not for me. I will try the hourly options.” These are normal human reactions, but not necessarily the right ones. The market is fractal in nature. Fractals have a property called self-similarity, meaning that they are the same on all scales. For example, if you look at a chart that has no X and Y axes for price and time and there is no label on the chart to tell you what it is, you will not be able to tell if it is a 1, 5, 15, 20 minute, daily or yearly chart. From a purely objective point of view it does not matter if you pick a 1 minute chart or a monthly chart. This also means that whatever strategy works on the 1 minute chart will also work on the monthly chart, just a lot slower. Try guessing what the time frame and instrument are in this chart. This is very important to understand, because the point of trading is to make money, not scratching an itch that won’t go away. Picking which time frames or options to trade is entirely subjective. This means that you should trade whichever time frame or option you feel comfortable trading. If you have no problem calling or putting every 2 or so minutes, then do it. If you don’t have the time to follow the market all day – trade daily options. If you get emotional too easyily, keep your distance from the market, trade daily options. If you can maintain analyzing the market at a constant rapid pace for a short period that you’ve decided to trade for, then keep to the lower time frames, trade turbo options. But firstly, there should be a solid mental framework that doesn’t let the emotions of quick wins or losses cloud analysis. Humans in general cannot, do not and should not trade constantly. They cannot make the analysis needed to trade fast and efficiently enough. That role is reserved for HFT or high- frequency trading systems that make up 80% or even more of the total trading volume worldwide.